Consider the case of ‘Ali’ from Iraq. Ali (not his real name) fled Iraq because of threats against him from militias because of a family member’s history in the Ba’ath party. Although Ali was never in that party, he was targeted by association, a common and continuing problem in Iraq. Ali fled to Indonesia and was interviewed by UNHCR, which approved his case as a refugee. Then he waited for resettlement, but it never came. After a few years, he took his chances on a boat for Australia in 2010. He was taken to Christmas Island and interviewed and then sent to the mainland detention centres. At the time he arrived he was termed an ‘offshore entry person (OEP)’ and was therefore excluded from making an application for a protection visa until the Minister lifted the bar. He was also referred to as an ‘irregular maritime arrival (IMA)’ in some Immigration documents. Initially his case was refused by Immigration, despite the positive finding of the UNHCR in Indonesia. Fortunately his case was successful on review and in February 2011, he was accepted as meeting the refugee criteria. At the time, he was still in detention but his condition was deteriorating. He was finally released into the care of a family member who was already an Australia citizen, but he was not given permission to work. He was granted the Temporary Safe Haven Visa (TSHV) for a week, which created a new barrier to lodging a protection visa under s91K, unless the Minister lifted the bar. That is as far as he has managed to get. He has undertaken further security and police checks, all positive. His status changed by mid this year when his bridging visa E expired, but he was not granted a further bridging visa, so he is technically unlawful and at risk of detention – despite the positive refugee finding back in February 2011. Inquiries with Immigration about the case were met with standard replies such as ‘the Department is awaiting checks from an outside agency (code for ASIO)’ or ‘the case is still being processed’. It was unclear what that latter explanation meant because there was no visible progress to being granted a substantive visa. He is now married to an Australian citizen and has a child here. But although his immigration status remains unchanged, the terms used to describe him have changed. In June 2013, the term ‘offshore entry person’ was repealed from the Act and replaced with another three word term leading to a three letter acronym – ‘unauthorised maritime arrival (UMA)’. With the arrival of the Coalition Government, the legal term UMA remains unchanged in the Act. But the new Minister insisted on calling people ‘illegal maritime arrivals (IMA)’despite no such term appearing in the Act or Regulations. In fact the term ‘illegal’ has not been in Migration Law since 31 August 1994. The other dramatic change lies in the so far unsuccessful attempts to reintroduce the Temporary Protection Visa (TPV). The new version of the TPV (TPV 3.1) provides no mechanism of ever getting a permanent visa. The TPV gives a three year temporary visa, with a bar to applying for any other visa, no return travel facility and no family reunion. The deal with the Palmer United Party (PUP) was to have another type of visa the Safe Haven Enterprise Visa (SHEV) as well as the TPV. The regulations for the SHEV have not been yet disclosed, but it seems it will be a five year visa, with some access to other visa applications being possible after three and a half years of work or study in as yet undesignated regional areas. I explained this to Ali. I told him he might get the city visa (the TPV) which will take him nowhere but he can work. Or if he goes to the country, and works or studies for 40 months on the ‘country visa’ (the SHEV) then he might be able to apply for another visa to stay. His only alternative is to return to Iraq and lodge the partner visa from there. But since he was found to be a refugee from Iraq he still fears to return there, especially with the high level of violence due to the fighting against ISIS. He tells me ‘I cannot go to Iraq, I will be killed. I just want to stay here with my wife and child, what should I do?’. A question I cannot answer. Ali had lived in a regional area for a while, but had returned to Sydney. He wants to work but has no permission to work. He has no Medicare, and no income apart from limited Red Cross assistance. He has a wife and a young child to support. Culturally it is very hard for him to not be the family ‘bread winner’. His only choice is likely to be to accept the SHEV, and go and live in the country for forty months, hopefully find work and then apply for a partner visa, assuming that will be legally possible by then. The ‘earn or learn’ slogan may go down well with some, but Ali’s case does not fit the announced criteria for the SHEV. He would probably find it easier to get work in the City, remain close to the extended family and be able to support his wife and child. Otherwise they will have to pack up for the country in the hope of finding work and suitable accommodation. If he were a young single man, this would be easier, but he is now 50. After winning his case and being accepted as a refugee in February 2011, he is now worn down by this long process. His self-esteem was destroyed by a long period in immigration detention. His identity is now also gone. I recently received a letter for him where he was referred to only by his boat number and the term ‘illegal maritime arrival (IMA)’. His name was nowhere to be seen on the letter and so he is now just a boat number and a derogatory three letter acronym. Bad laws make people suffer. This is dreadful and makes me feel ashamed to be an Australian. How can this treatment of refugees seeking asylum in our country continue? I have the distinct feeling that karma will get Morrison in the end. One cannot treat people with such indignities. When H. G. Wells scared people with the prospect of machines that could think like 'a man', G. K. Chesterton countered by suggesting a far more scarier suggestion about men that would think like a machine. A worse sequel has followed where some people seem to find it at least acceptable that disadvantaged and vulnerable people should be stripped of their name, personality and humanity because we are too cosy and comfortable in our affluence to give them a helping hand. I think our governments needs to ponder on Sundays Gospel. Whatsoever you do to the least of my brothers that you do unto me. Well said, Kerry. Depriving people of their names is such a nasty and often-used means of denying their humanity. Woody Guthrie's "Deportee" comes to mind: Goodbye to my Juan, goodbye, Rosalita, Adios mis amigos, Jesus y Maria; You won't have your names when you ride the big airplane, All they will call you will be "deportees". How can we claim to be Christians and treat other human beings like this? But what do I actually do about it? I sit around feeling awful, I sign petitions, "like" things on FB, but I don't actually change anything, do I. Forgive me, Father, I know not what to do. This is such a disgraceful story which as an Australian I feel deeply ashamed that our government can treat these people in this way. We have accepted people from other countries in past years most have made real contribution to the growth of our country but somehow these people's contributions have been conveniently overlooked. Now we seem to have lost our sense of compassion and sense of common decency for people seeking refuge from violence and death in their own countries. How much longer can we as citizens put up with the continuing shame that this government continues to show the world about how Australian people treat genuine refugees in our name. Our Prime Minister and Minister for Immigration should hang their heads in shame. Thanks ESAW (Eureka Street Article Writer) Kerry , member of IARC and JRS. This is BDP 1895 (Boat Person Descendant), who is a member of COTA, RUB,U3A,St.V.S.,and an RC. The TVP you write about may become a SHEV and is an IMA or is it a UMA? Language , language ,wherefore art thou? Spose at least with acronyms real people hide quietly in someone's book of statistics and really can't make a fuss cos they are not real people. Incidentally I believe the immigration minister has an acronym too. This article should be compulsory reading for every MP. This human being's very personhood has been either attacked or ignored by a system which can change a person's identity by bureaucratic process. This is intolerable. This is not Australian. I find it difficult to accept the repeated humiliations delivered to all people - including to myself - by this atrocious government. Surely if anyone met any asylum seeker in person and had any involvement with them, their views would change. Have Abbott and Morrison never really met a refugee? Thanks Kerry and Murray: "deadfall" and "ashamed" sum it all up really! It is difficult to conceive of what goes through the minds of co-religionist Cabinet ministers` sitting in their pews yesterday and listening to the Gospel on how they will be judged by our King for how they deal with people in terrible need. I also recall that Abbott etal killed the most sensible policy that government has come up with: the Malaysian (and Indonesian) solution of processing asylum seekers before they got on boats to Australia and then placing them here and elsewhere efficiently. All for votes. So hypocrisy is a part of this truly evil mix. This makes me ashamed to be Australian. I am reminded of an SBS program on the Holocaust. "We should have known". Did you not hear my screams of absolute anguish at the Orwellian bastardry written here about a system so dehumanised it breaks and destroys human beings ? There are so many Ali's and Miryams etc among the 30 000 plus human beings in Abbott's asylum seeker limboland. And 7 122 children ( stats 31 October) Shame does not cut it. I am outraged and disgusted at what poll- following ignorant politicians have done to our humanity. We ARE better than this. A remark on a recent radilo program about refugees struck me. The message it gave was that until we can look a refugee in the eye and see a fellow human being with feelings like us, this inhumanity will continue. I believe it is the responsibility of the government to educate Australians do do just that. Australians can be extremely kind but they have actually been encouraged by the Coalition and Labor parties, in pursuit of votes, to think of asylum seekers as lesser beings than we are. Under the Coalition government the level of our inhumanity has hit rock bottom. 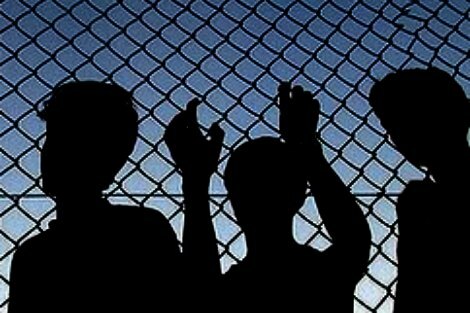 The psychological damage done to people, including children, in detention centres is unimaginable. If Minister Scott Morrison wants to label fellow human being in distress as IMAs (illegal maritime arrivals), in historical terms around 200 years ago, indigenous Australians then would have viewed the ancestors of most Australians like us and Mr Morrison, who entered Terra Australis by sea as IMAs too. Perhaps Minister Morrison, Minister Bishop and PM Abbott could also be labelled as a different version of IMA - "Insensitive Ministers At-large". The inhumane treatment by our government has been going on for too long. Christians must leave the comfort of their armchairs and stand up, be heard, pick up a pen, send an email to all our local senate members. Refugees, asylum seekers are human beings and must be treated as such. How can we remain apathetic knowing such inhumane treatment is still being meted out? I have heard too many stories now to ignore what's going on. Many good people are doing their utmost to help 'these strangers in our midst.' It's up to the govt. also to immediately take action. With this government, it's surely only a matter of time before they start tatooing the numbers on these people's forearms. Actually, one probably shouldn't raise such ideas even in irony. One of their think-tanks would probably think it was a good idea. Thank you, Kerry, for raising our awareness, albeit while dashing our spirits. I cannot add to the previous comments, except to reiterate the question: What can we do? Why no one really challenges section 46a of the migration act? You only feel the cruelty of this bar on these people, when you make a new life and family with one of them and are in constant fear that your family and home and everything you built, may suddenly be torn apart. Why they are barred from applying for partner visas? Many of these people lived, worked and found love here. They didn't harm anyone or some, even didn't use any government support money. Personal grief, complicated by group dynamics, is a volatile mixture. Phillip Hughes' death reminds us that personal stories highlight the huge variety of needs and perceptions surrounding a death in the workplace. When do we tidy the desk of the colleague who won't be back? There is a time, but maybe it's not yet.